Our precalibrated glass capillary tubes are marked with a black calibration line at 60mm from one end. The calibration line establishes a uniform blood column length. 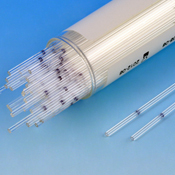 Treated with ammonium heparin, these tubes are designed for both safe blood collection as well as accurate micro-hematocrit determinations. Packaging: 100 tubes per vial, 10 vials per box (1000 tubes per box).